Aerial Houston Skyline Panorama – This is a aerial panorama of the Houston skyline view of the city which includes the Buffalo Bayou along with the Jamail Skate Park and the Eleanor Tinsley Park with all the high rise skyscrapers in downtown in view. Houston is a large city with around 2.3 million people in the area and some of the tallest skyscrapers in Texas and the southern United States. Acutally you can find high rise buildings all over this city but some of the taller ones are in the downtown area. Houston has nine major performing arts with six performing halls. You can spend your time at any number of place in downtown in the many parks in downtown or at the theater district catching a play or the opera. Houston also has some top notch restaurants too. Houston is also home to the Astros and the NRG stadium and minutemaid park. Houston is a large city with a population around 2.3 million people which makes it the fourth most populous city in the US and the biggest in Texas and the southern US. The skyline of Houston is a very impressive site with some of the tallest modern skyscrapers buildings in the US. In this image you can see the Heritage Plaza, Chevron, Wells Fargo and the tallest building in Houston the J P Morgan Chase Tower at 1002 ft and it is the 17 tallest in the US. Houston is the seat of Harris county and was founded in 1837 near the banks of the Buffalo Bayou or Allen Landing as it is called today. The city was name after General San Houston after he won the battle of San Jacinto. Houston has been a growing city because of the port of houston and railroads along with oil boom from the early 1901. Houston has other industry that have made it thrive in america such as energy, manufacturing, aeronautics, and transportation. Also NASA mission control is located in the city. Houston has also taken the lead on health care with many people coming to the Medical Center for top notch doctors and hospital with the latest advancement in medical care. 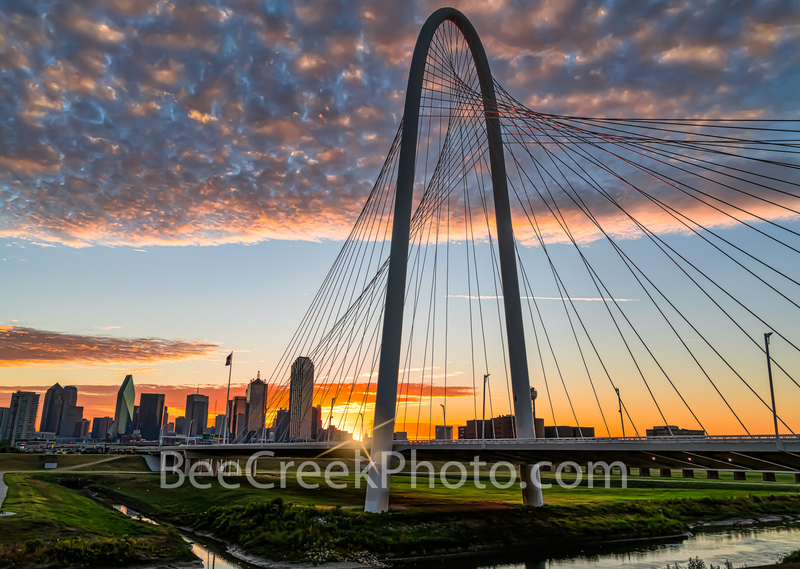 We think this bayou city skyline makes a great landscape of this beautiful city. Houston Sunset Skyline Pano – Capture this aerial panorama of Houston Sunset Skyline right as the sun was setting and as it was going down it started to back light these wonderful clouds over the city with these wonderful colors of orange, pinks and yellows. We wanted to capture downtown Houston skyline with IH45 in view so an aerial was our best option so this area of the cityscape is looking at the Theater district of the city. Houston also has a reputation of a place to see top notched performing art along with access to several museums in the area. The Theater distric performing art has nine major performing art group along with six performance halls. You can see Opera, a plays, the ballet and any number of music events including the well known Houston Symphony Orchestra. Houston is a large city with a population around 2.3 million people which makes it the fourth most populous city in the US and the biggest in Texas and the southern US. The skyline of Houston is a very impressive site with some of the tallest modern skyscrapers buildings in the US. In this image you can see the Heritage Plaza, Chevron, Wells Fargo and the tallest building in Houston the J P Morgan Chase Tower at 1002 ft and it is the 17 tallest in the US. Houston is the seat of Harris county and was founded in 1837 near the banks of the Buffalo Bayou or Allen Landing as it is called today. The city was name after General San Houston after he won the battle of San Jacinto. Houston has been a growing city because of the port of houston and railroads along with oil boom from the early 1901. Houston has other industry that have made it thrive in america such as energy, manufacturing, aeronautics, and transportation. Also NASA mission control is located in the city. Houston has also taken the lead on health care with many people coming to the Medical Center for top notch doctors and hospital with the latest advancement in medical care. Houston stock. Aerial Houston Skyline Night Pano – Aerial Houston Skyline pano at night along IH45 in downtown area of the city. This image show IH45 along with the Aquarium with its colorful ferris wheel plus the city hall with it rainbow of colors among the modern high rise skyscrapers. Houston has some of the tallest buildings in the southern US and the tallest buildings in Texas. This city has a lot to offer from it culture events, parks, to it business friendly enviorment you can find it all here. Houston skyline stock. Dallas Skyline Panorama Night2 – This is an panorama of the Dallas Skyline after dark with only the light from the high rise skyscrapers in view in the downtown area. This cityscape has all the usual iconic dallas buildings like the Reuion Tower, Heritage Plaza, Fountain Place, Bank of America, to the alway colorful Omni Hotel in view. Fort Worth Skyline at Twilight Pano – Another panorama aerial capture of the Fort Worth skyline at twilight. Again these great purple led lights on the seventh street bridge really make it come alive at night. The seventh street bridge connects the University area with the downtown across the Trinity River. Fort Worth is the fifth largest city in Texas. Ft Worth is located in central north part of Texas and the county seat is Tarrant County. The latest census is that the population for Fort Worth is estimates, at around 854,113. The city is the second-largest in the Dallas–Fort Worth–Arlington metropolitan area or the DFW Metro. We wanted to show what a wonderful Fort Worth Skyline at Twilight can be now that this little cow town grew up. My Aunt lived there and she would always say you come to visit my cow town from the big city, we lived in Houston. 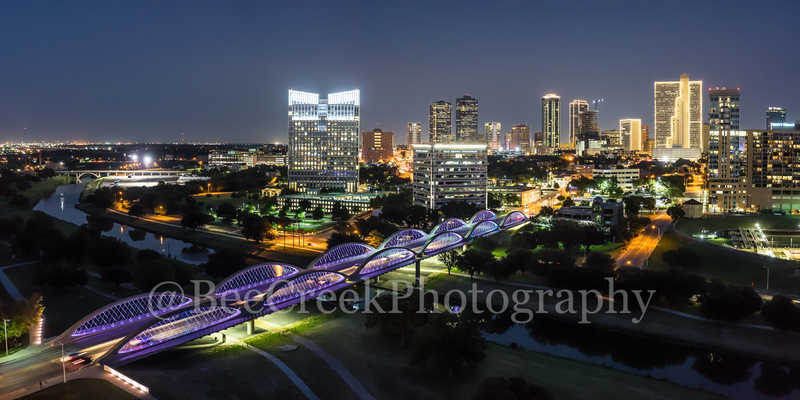 Twilight Fort Worth Skyline Pano – We capture this aerial panorama image of a twilight Fort Worth skyline pano with the Seventh Street bridge as it crosses the Trinity River in downtown. The 7th street bridge was lighted with purple led light so it really popped in this image of the cityscape. The seventh street bridge led light seem to change colors every day so that was a nice treat. Fort Worth is the fifth largest city in Texas. Fort Worth is located in central north part of Texas and the county seat is Tarrant County. The latest census is that the population for Fort Worth is estimates, at around 854,113. The city is the second-largest in the Dallas–Fort Worth–Arlington metropolitan area or the DFW Metro. We like this aerial twilight Fort Worth Skyline pano over the city. Thanks for looking. Fall Austin Skyline Pano – We love fall Austin Skyline in this aerial pano show off very urban Austin skyline that captures the downtown and all the high rise buildings hugging the shoreline of Lady Bird Lake with the city and IH35 in view. Again the water had this nice reflection of the clouds and high rise buildings in the water along with the colorful fall trees along the banks. This Austin skyline image capture this urban landscape in fall of the Austin cityscape from the east side and shows some of the citys tallest buildings like the Austonian, the new Fairmont Hotel, with the top of the Frost just barely peeking above the crowd along the shoreline. Until they finish the Independent, the Austonian will remain the tallest in town at least for another year or more. You can just barely see the top of the State Capitol trying to peek above all the other high rise buildings in downtown but it is there at least for now. Austin is the fastest growing city in the US and the 11th most populous city and is the seat of the Texas State Capitol. At the last census this urban city had a population of just over 947,000 and growing. It is getting harder and harder to capture the Austin skyline without a dozen or so cranes in the photo. Austin Skyline Twilight Panorama – We captured this Austin Skyline twilight panorama of the city right after sunset as their was still some light and color in the sky from along the Ladybird Lake hike and bike trail in downtown. We thought the modern Austin skyline twilight with the high rise building were brilliant against the violet colors at twilight with just a hint of the sunset colors still viewable along with the many skyscraper buildings like the Frost, Austonian, Four Season Hotel, Austin 360 and the W along with many others high rise building all crowding together along the shoreline. You can see the reflection of the skyline in Ladybird lake, but come back in a year or two and it will likely be different. The city skyline has been changing very fast over the last four or five years as new construction is popping up with new high rise buildings almost every six or seven months in this town. Austin is home to the Texas Capital and the University of Texas along with many tech companies including Apple, Amazon, IBM, Oracle, google, intel to name a few and the growth has been crazy it is fastest growing city in the US in 2016. The metro plex of Austin-Round Rock is over two million people and all you need to do is drive on IH35, or MoPac you will swear all two million are on the roads with you. Austin has government employees, students, teachers, tech companies, tech workers, musicians, plus blue collar workers. Austin is also where the slogan of Keep Austin Weird, which was the city attemp to protect small business and restaurants from its incredibly fast growth. Austin also refers to itself as the Live Music Capital for it many musicians and venues where you can hear live music around the city. Austin also has plenty of lakes with Lady Bird Lake, Lake Austin in the city limits and Lake Travis is within 20 miles to the west in the hill country. We captured this panorama of the San Antonio Skyline which includes the area along the riverwalk with the Tower of the Americas, light from the Alamo Dome, Tourch of Freedom and many other city business. The hotels in downtown are some ot the tallest buildings in the area the Marriott, the Hyatt, and the Hilton all tower above to give the city a beautiful skyline near the riverwalk. Posted in Best Of and tagged Austin cityscapes, Austin skyline, austin skyline stock photos, Austin skylines, Best Austin cityscapes, Best Austin Skylines, best cityscape, Best cityscapes, Best Dallas cityscapes, Best Dallas skylines, best Fort Worth Skyline, Best Forth Worth skylines, Best Houston cityscapes, Best Houston skylines, best panorama of Houston, best panoramas of Austin, best panoramas of Dallas, best skyline images, best skyline panoramas, best skylines, Best texas cityscape panoramas, Best Texas skyline, Best texas skylines, Dallas cityscapes, Dallas Skyline, Dallas skyline stock, Dallas skylines, Fort Worth cityscapes, Fort Worth skyline, Forth Worth skylines, houston cityscapes, houston skyline, houston skyline stock photos, Houston skylines, San Antonio Skyline, San Antonio Skylines, San Antonio stock photos, skylines on January 19, 2018 September 26, 2018 by Bee Creek Photo.